your local agent Why do this? Local BranchIf you make Worldchoice Travel - SHREWSBURY your local branch, then all the contact details shown at the top of this website will be those for the Worldchoice Travel - SHREWSBURY branch. We will need to use an anonymous cookie to make this happen. This doesn\\\\\\\\\\\\\\\\\\\\\\\\\\\\\\\\\\\\\\\\\\\\\\\\\\\\\\\\\\\\\\\'t store anything about you and you can read more about cookies in our Privacy and Cookie Statement which is linked to at the bottom of every page. 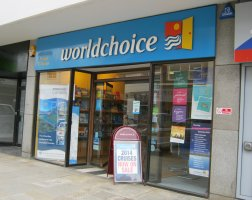 Being your local independent travel agent means that at Worldchoice Travel Shrewsbury we can help you with all your travel arrangements and choose from the complete range of holiday providers. From a cruise in the Caribbean for a special occasion to a family holiday in Europe; a flight to visit a relative to a city break. We take time to understand what you are looking for and find the best solution. With over 150 years of experience between us, the team at Shrewsbury can find the best holiday for you, with fantastic deals and the ability to create bespoke itineraries we will make sure you get the perfect holiday to suit your budget and requirements. We look after you and your holiday booking every step of the way and we always keep in touch with our customers. We also love to hear about your holiday experiences and future holiday plans, so if you’re in Shrewsbury do come in for a cup of tea and a chat. We will be delighted to see you! Our staff are experienced and professional, and provide a relaxed and friendly service. We treat our customers as individuals and look to fully understand their needs and preferences, which in turn enables us to provide unbiased and honest advice. As local independent agents, Worldchoice Travel provides a sense of security, our staff are honest and dependable; they are helpful in resolving issues should they arise before, during or after their customers’ holiday. Based in local towns the stores have an approachable, family-like feel and provide a stress-free booking experience. And with 100% financial protection our customers have peace of mind that their money is protected. Learn more about our holiday specialists.